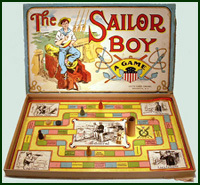 With year end thoughts directed toward Santa's workshop, let me show you a few things with a maritime theme that may have been on someone's wish list fifty to a hundred years ago. 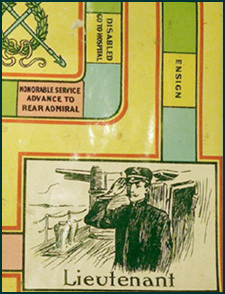 The uniforms date this board game just prior to WWI, but the suspense of rising to success at the whim of the dice has appealed to generations before and since. 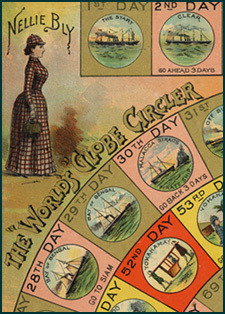 Another such achievement-themed game, based on an actual historical figure, a heroine of the year 1890: "Around the World With Nelly Bly". 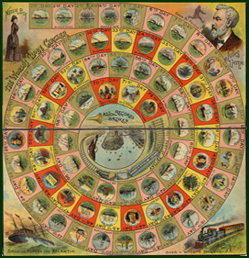 This wonderfully detailed game board commemorates the feat of the intrepid Nelly Bly, who actually beat the 80-day world circumnavigation of Jules Vernes' fictional character Phineas Fogg, leaving New York on November 14, 1889, and returning to great acclaim by January 25, 1890. Nelly Bly (from a Stephen Foster song) was actually a pen name assumed by Elizabeth Jane Cochrane, an enterprising adventurer and feminist who successfully entered the hitherto all-male bastion of career journalists. Joseph Pulitzer and his newspaper, the New York World, shrewdly sponsored her idea of the global stunt, increasing their circulation and providing Cochrane with a platform for her investigative championing of labor, family, and health issues. Traveling on the Continent at the outbreak of WWI, she became an observer on the Eastern Front for the New York Evening Journal. Pneumonia claimed her in 1922 at age 55. 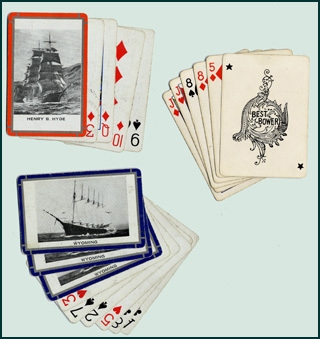 Decks of cards fit nicely into stockings; both the ship Henry B. Hyde, and six-mast schooner Wyomingfigure largely in Maine's maritime history. Notice the 'Best Bower' joker in the third deck (below). 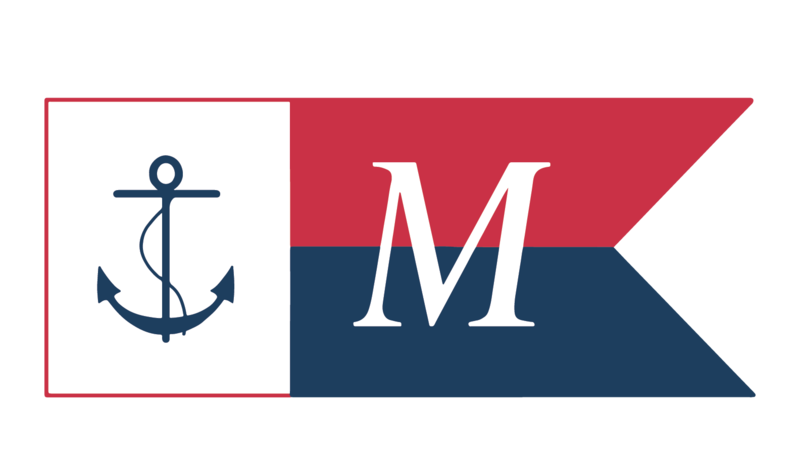 The best bower, as contrasted to the small bower, was the largest anchor on a ship, traditionally hung off the starboard rail. 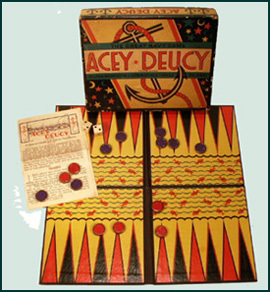 A variation of backgammon adapted by the U.S. Navy became known and commercially marketed as 'Acey-Deucy'. This set is circa 1930. 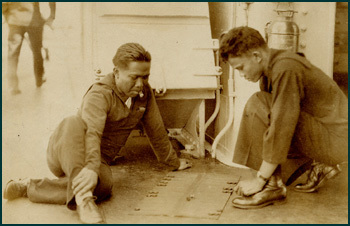 Two naval aficionados hard at it. Blocks are fun; this set appears to ambitiously include the makings of the ship's cradle. 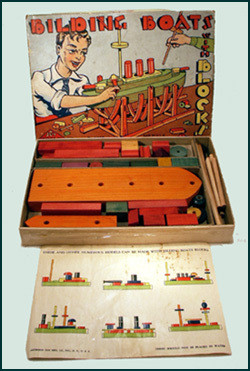 I am skeptical that all the pieces needed are really in the box, though I haven't actually tried it. The tie (not included) roughly dates our happy builder to sometime before 1940. 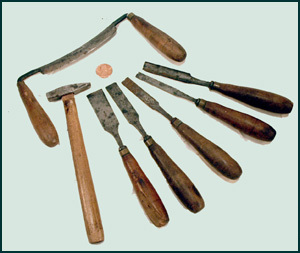 For the budding shipwright of an earlier era, St. Nick might have brought these tiny, but real tools, which have been perfectly proportioned to fit the hands of an eight-year old. Compare their size to the penny. Lessons about sharp edges might be relevant; your eight-year old could shave with the edge on the drawknife, if he/she had a beard, that is. 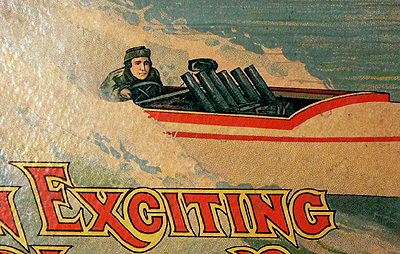 Going fast over the water has always thrilled, even though engines and speed-boats have changed dramatically since this pursuit game was printed ca. 1925. 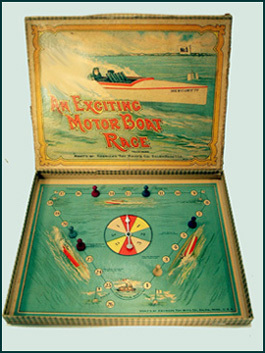 Just spin the dial, open the throttle of your duel in-line supercharged Packards and roar like you're on the final three mile lap of the International Sweepstakes on the Detroit River -- sort of. Watch out, though; it's all over if you land on 'Hot Bearing. Lose Turn to Cool'.